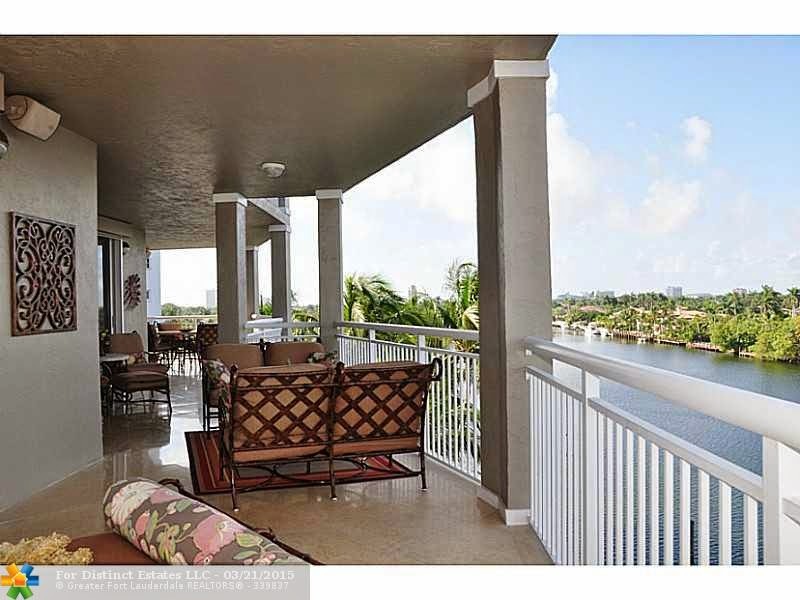 Showcasing a panorama of city, Intracoastal and ocean views from within the waterfront condominium community of Villas of Sunset Lakes in the world-class city of Fort Lauderdale, Florida is this tastefully remodeled condo. Encompassing the entire 5th floor, this spectacular Villas of Sunset Lakes residence boasts 3,100 square feet of living space with 3 bedrooms and 2.5 bathrooms. Elegantly appointed, the beautifully crafted interior displays a number of highly desirable features including a gourmet kitchen with custom cabinetry and high-end stainless steel appliances, a Master bedroom with custom walk-in closets, a spa quality Master bathroom equipped with a Jacuzzi tub and an expansive covered terrace overlooking the glistening waters of the Intracoastal. Additional features include marble flooring, plantation shutters, perfectly crafted custom built-ins and 2 deeded parking spaces. A private boat dock with direct access to the Intracoastal and Atlantic with no fixed bridges is also available. 321 Sunset Dr # 5 is located in Fort Lauderdale and is currently asking $1,670,000. This Villas Of Sunset Lakes listing is courtesy of Related Isg Int'l Realty MLS# F1333054. The Villas of Sunset Lakes is a waterfront condominium community located in Fort Lauderdale, Florida. Residents of this captivating community enjoy access to an array of premium amenities including 24/7 security, fitness center, library, billiards room and heated pool. Ideally situated in the heart of Las Olas, Villas of Sunset Lakes commands an enviable address just steps from the beach, waterfront restaurants, upscale boutiques and iconic nightlife.